Serious drain and sewer problems are nightmares that no homeowner ever wants to face. Sewage backups are disgusting, and they can cause thousands of dollars in damage. Fortunately, Rowell’s Services makes repairing these issues faster, easier and more affordable than ever using trenchless excavation techniques. In the past, repairing and replacing sewer lines involved digging up lawns and patios and destroying landscaping. Modern trenchless excavation techniques make it possible to solve sewer problems without making a huge mess. Trenchless pipe bursting is one of the best ways to repair residential sewer lines, and it’s a viable option in many situations. Trenchless excavation is simple. We start by digging two holes on your property. This provides access so we can install your new seamless pipe. One end of a flexible pipe is fed into one hole while specialized equipment at the other end pulls it through. A bursting cone on the end breaks up your old sewer line as it is pulled into place. The new pipe is made of a special polymer material that hardens after it’s been placed. When the job is done, you will be left with a perfect leak-free sewer pipe that will provide several years of reliable service. 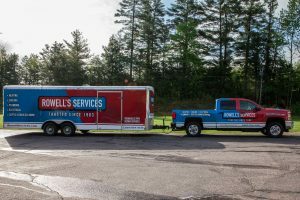 At Rowell’s Services, we offer professional trenchless excavation services in Northfield, New Hampshire, and the surrounding areas. We use state-of-the-art equipment to solve your sewer woes without destroying your lawn, breaking up your patio or uprooting plants and trees. The entire process is faster and a whole lot less messy than traditional excavation techniques. We understand that no homeowner wants to deal with a messy and expensive sewer excavation project. Trenchless excavation is faster, neater and costs less than traditional sewer repair techniques that involve digging up a large part of your lawn. To learn more or to schedule an appointment, please call 603-934-4145.